BOISE - Idaho motorists are paying more and more of the cost of maintaining the state’s roads, while drivers of heavy trucks are paying less, according to a new state study - though the trucks are causing far more damage to the roads. Meanwhile, Idaho faces a “widening gap” between its road funding and its needs, experts told Gov. Butch Otter’s transportation funding task force Tuesday, and task force members said the most promising source to fill that gap is a gas tax increase, the very thing Otter failed to persuade lawmakers to endorse for two years running. COEUR D'ALENE - Boekel Road, between U.S. 95 and Government Way, will be closed to through traffic beginning Monday (July 26) and will remain closed through Friday (July 30), the Idaho Transportation Department announced. The work is part of a major reconstruction project on U.S. 95 from Wyoming Avenue to Idaho 53. The week-long closure is the result of rain delays in May and June. Access to businesses on Boekel will be maintained. 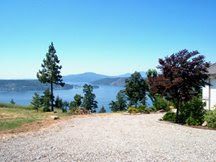 The contractor for the $6 million project is Interstate Concrete and Asphalt of Coeur d'Alene. The project is funded with savings from federal highway stimulus projects bid earlier this year. The project is expected to be complete by this October. ITD and the Idaho State Police advise motorists to slow down and pay attention when driving in work zones, where increased speeding fines and other penalties apply. Motorists are encouraged to plan ahead and dial 5-1-1 or visit 511.idaho.gov for information on the state highway or interstate system. This weekend hosts the exciting annual Downtown Street Fair, Taste of the Coeur d’Alenes, and Art on the Green. The Street Fair has expanded and streets will be blocked on Sherman and Northwest Boulevard at Lakeside rather than at Second Street, to add additional vendor space. Traffic headed into the downtown area will be routed to the east on Lakeside and then can go south on Third Street, or north on Fourth Street. Traffic leaving the city’s Third Street parking lot will be directed eastbound only and northbound on Fourth or Seventh streets. Resort traffic only will be directed southbound on Second Street and leaving the resort eastbound only on Front. For more information, please contact 769-2233. This is scary news; 25 percent of the country's bridges remain "structurally deficient" or "functionally obsolete," according to testimony at a House Transportation Subcommittee hearing Wednesday. About 150,000 bridges -- nearly one in four -- are considered deficient, Here's the story from the Minneapolis-St. Paul Star Tribune. Things may get kind of quiet on the blog for a little while. No, we won't be experiencing technical difficulties, but I will be heading off for vacation next week. I've asked Jeff Selle in our office to fill in on blogging but that will depend on how much time he has on his hands. He's not used to multi-tasking like I do: With one hand I'm posting an article on how every time you start your car engine you're killing a penguin and with the other hand I'm trying to type a newsletter with no typos. Depending on how things go, I may do a little blogging 'from the field,' but don't expect things to get completely back to normal here until August 2. KMPO will host a Public Transportation Roundtable meeting next Wednesday, July 28th at the Coeur d'Alene Library from 1:00 pm to 2:30 pm. Here's the agenda for the upcoming meeting. It's only late July but it's already been one heck of a busy summer. What have we been up to here at KMPO? A little of everything. Here's our July newsletter to bring you up to date. Seal coating will begin on Interstate 90 over the Fourth of July Pass on Thursday (July 29). Crews will begin Thursday on the westbound travel lane and then switch to the eastbound travel lane. Seal coating of the westbound and eastbound passing lanes will follow. The interstate will be reduced to one lane in each direction during seal coating. The speed limit will be reduced to 45 mph through the work zone. Seal coating is a process designed to prolong the life of the roadway surface. A thin layer of asphalt is laid down, followed by a layer of rock chips. Once the liquid asphalt has set up, excess rock chips that have not adhered to the surface are removed. A consulting team has been chosen to lead the effort to revamp McEuen Field in downtown Coeur d'Alene. Possible amenities the team will consider for the park include bike and pedestrian paths and possibly incorporating the Centennial Trail into the park. Here's more on the decision from the Coeur d'Alene Press. The Coeur d’Alene Water Department will be temporarily closing Neider Avenue from US 95 to Fruitland Lane for three days beginning Monday, July 26th. Crews will be replacing a water main in the area. Neider Avenue should be reopened by Thursday, July 29th. The southern lane of Neider Avenue will have daily closures for approximately 1½ weeks to complete the water main installation. The businesses affected will have continuous customer access from the Fruitland Lane side of Neider Avenue. Fired Idaho Transportation Director Pam Lowe was back in court yesterday so that a judge can decide whether or not the state’s transportation director is an at-will employee who can be fired for any or no reason. Meanwhile, the Idaho Transportation Department acknowledged that a controversial management contract that Lowe contends she was fired for trying to scale back has now swelled to $85 million. The subject of impact fees are back before Kootenai County commissioners. A hearing will be held next month on measures that would create new impact fees to help accommodate new growth. Impact fees collected from builders of new homes would help pay for improvement projects of all kinds, including ones for the law enforcement and fire departments, as well as local highway districts. Citylink's ridership numbers were up AGAIN in June, with increased numbers on every route. Here are the June numbers. Harrison Street between 14th and 16th streets in Coeur d'Alene will be closed today and tomorrow to prepare for the installation of a signal at 15th Street and Harrison Avenue. The signal is being installed due to increased traffic and congestion in that location. Luke I Am Your -- Public Transit Rider?? Blogger Holly thought it imperative that I post this before the weekend. For the republic. I've seen some strange characters on public transportation but this beats them all. We've been talking a lot lately about how easy it is to get around Kootenai County because there's so little congestion. That leads many people, myself included, to own their own vehicle and to drive to the majority of places they frequent. There's a downside to that though and I'm experiencing it today. 1 tie rod + 1 idler arm + 1 alignment + 4 new tires + 1 battery = Holy cow, Glenn I need a raise! I take back what I said about the voodoo doll. Riding my bike more often is looking better and better. Hey Kids- Look At Those Whales! Those Aren't Whales! Thanks to blogger Holly for sending this Seattle Times article. Apparently there was a full moon over Puget Sounds last Sunday. Four, in fact. My favorite line is the last: 'The men apparently had been drinking beer.' Well duh. So what's the dumbest thing you've done when angry at another driver? I have to admit I'm the queen of leaving nasty notes on peoples cars who park badly and take up two spots. Or people who park in handicap spots without permits. Following up on a post from yesterday, the Hayden City Council last night decided against a recommendation to pursue truck weight limits on Government Way to improve safety for bicyclists. 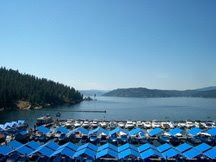 Here's the update from the Coeur d'Alene Press. The Idaho Transportation Department has just announced that a project to realign and reconstruct 31 miles of U.S. 95 north of Coeur dAlene received environmental clearance last week, allowing the development of future construction projects in the corridor. The Federal Highway Administration approved the Final Environmental Impact Statement (FEIS) on July 2 for the U.S. 95, Garwood to Sagle corridor project. That approval clears the way for planned right of way purchases and the beginning of preliminary design. The Garwood to Sagle corridor serves a rapidly growing population in northern Kootenai and southern Bonner counties and is an important part of Idaho's primary north-south highway. That decision includes approval of an alignment for the future highway, which was identified as the Preferred Alternative in the FEIS. Right of way acquisition will focus on the southern end of the corridor, from Boekel Road to Granite Hill, in Kootenai and Bonner counties. Construction will begin when funding becomes available. The U.S. 95, Garwood to Sagle corridor is one of six transportation corridors throughout the state funded through the GARVEE Transportation Program, which allows Idaho to plan, design and build more highway projects in less time than through traditional transportation funding methods. It uses Grant Anticipation Revenue Vehicle (GARVEE) bonds to fund critical improvements in the six transportation corridors. The Post Falls Police Department, Kootenai County Sheriff's Department and other local agencies are teaming up with the Office of Highway Safety in an aggressive driving emphasis starting this Thursday and going through July 26. Aggressive driving is the highest single contributing factor in both injury and fatal crashes, according to law enforcement statistics. Behaviors officers will be looking for includes failure to yield the right of way, stop sign violations, speeding, driving too fast for conditions, reckless operation, tailgating and disregarding traffic signs or signals. At tonight's meeting, the Hayden City Council plans to discuss limiting commercial truck traffic on Government Way to improve safety for bicyclists. The Hayden Bicycle and Pedestrian Ways Committee has recommended limiting truck traffic on the street to local deliveries only as a safety measure. Here's the story from the Coeur d'Alene Press. Here's my embarrassing moment of the week: I walked out of the office this evening and saw the bus coming. The stop is about a block away so I started running. Luckily someone else was getting on that bus too, so it stopped and I got just a few feet away when my shoe flew off and went under the bus! I asked the driver to pull forward or back up because my shoe was under the bus and he looked at me like I was a moron (probably a good assessment on his part at that point). He cranked the wheels to one side to pull away from the curb and right over my shoe! Another guy standing at the bus stop starting yelling 'Stop! You're crushing it! Back up!' I don't think the driver cared though cause he rolled forward all the way over it. The other guy at the stop grabbed it for me and we laughed hysterically as I tried to put on the crushed shoe, then jumped on the bus and tried to swipe my pass. I, and everyone else on the bus, was laughing so hard at that point I could hardly do it. Except the driver. He was obviously NOT amused. I managed to reshape the shoe for the most part but it's a lot worse for wear. It pinches my heel something awful now so I think this pair will be retired. I usually drove the world's first Toyota Prius. The rear window was segmented kind of like bugs eyes, so it was hard to see out when backing up. It would shut itself down after idling for a short amount of time too, so a couple times I actually tried to drive when a long traffic light turned green and founded out to my embarrassment that the car had shut itself off. My favorite car though was an early 90's Crown Vic former police car. The defrost didn't work so in the winter I had to scrape the outside AND insides of the windows. You may find a treasure though, so check out the CDA Press article and see if anything catches your eye. Then let me know if you bid on one. The Water Department will close 4th Street between Lakeside and Coeur d’Alene avenues next Tuesday, July 13th, to repair a leaking water service line. Work begins at 4 a.m. to minimize traffic disruption, but it may be necessary to close that short portion of 4th Street for the entire day. A detour will be provided for northbound traffic while the work is being performed. There will be a limited shut-down of water service to nearby customers, and they will be notified individually and directly. Street patching will be coordinated as soon as possible after work is completed. Idaho Transportation Department crews will be doing minor repair work at two locations along Interstate 90 beginning Tuesday, July 13. The work is part of the department's ongoing maintenance of the state highway system. Crews will work on the I-90/Northwest Boulevard overpass on Tuesday, patching the roadway surface with an asphalt overlay. Work will then move to Spokane Street under the interstate in Post Falls on Wednesday. Work starts each day at 9 a.m., after the morning rush hour and is expected to wrap up around 2 p.m. It takes place in Spokane, but here's an event you may want to check out if you don't have plans this weekend. 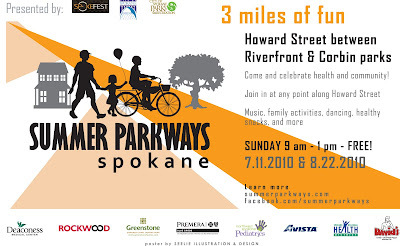 On Sunday, July 11, Howard Street from Riverfront Park to Corbin Park will be closed to automobile traffic for the first ever 'Spokane Summer Parkways' event. The road will be open to folks doing non-motorized events, such as bicycling, walking, roller blading and skating, skateboarding, etc. There will also be physical fitness activities like yoga, Zumba, Hula Hoops, jump rope, hacky sack, and martial arts offered free along the course to encourage a healthy lifestyle for everyone. Here's an article in today's Inlander about Spokane Summer Parkways. Come check it out if you can. Tired of having to worry about where those pesky pedestrians are when you're driving? Well quit worrying and buy a Volvo. The newest Volvo slated to be released this year, the 260 model, comes complete with a 'pedestrian Detection and Avoidance System' that applies the breaks, if you fail to, when in close proximity to pedestrians. Now if I could only get a cars that could sense a run-in with my mother... Anyway, check it out in this YouTube video then tell me what you think- overrated gadget or awesome life saver? Here's something interesting from the Spokesman's Huckleberries blog. They posted an article about how bicycling in New York City is better than in Sandpoint, ID. The the blog asks 'Would you rather bike in your community than New York City?' Something interesting to think about. There are only two replies posted so far, but both present interesting points of view. The emergency landing of a plane on the freeway in Post Falls could have been a lot worse. The pilot and three passengers all walked away and today the pilot talked to the Coeur d'Alene Press about the incident. Here's the story. Who would have thought it? It turns out that your chances of getting a traffic ticket in Idaho are a lot lower than other states. The National Motorists Association counted up traffic tickets issued in every state and found that Idaho is near the bottom of the list as far as sheer volume of tickets written. Here's how Idaho ranks, from the Coeur d'Alene Press.